The 2018 CDG Scientific & Family Conference was held February 23-25, 2018 in San Diego, California! Featuring 32 captivating presentations from a diverse panel of experts, 90 medical professionals and 53 families united to support and enhance CDG research, knowledge, therapeutic and alternative treatment strategies. The conference sessions were recorded and the post-conference video program can be viewed on the CDG CARE YouTube Channel. Read and share our CDG CARE Newsletter! May 16th – Congenital Disorders of Glycosylation (CDG) Awareness Day! What will YOU be doing on May 16th? JOIN the Campaign to Support World Congenital Disorders of Glycosylation (CDG) Awareness Day! Go green, spread the word, plan an event, share knowledge, hold a fundraiser, or volunteer with the Campaign! May 16th is World Congenital Disorders of Glycosylation (CDG) Awareness Day! 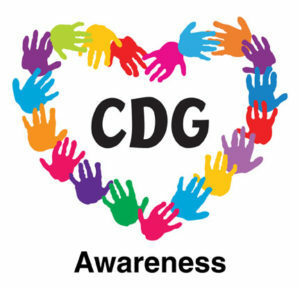 This day is designed to raise awareness and increase knowledge about CDG. Check out the State Map to see when your Governor officially proclaims May 16th as CDG Awareness Day in YOUR State! If you are interested in planning an awareness event on or around May 16, 2017, please send an email with your event information to worldcdgawareness@gmail.com. To access and download the complete toolkit containing social media materials, event maps, handprints, educational and press kit resources, please visit World CDG Awareness Day Campaign! SAVE THE DATE… July 26-28, 2019 for the upcoming 4th World Conference on CDG to be held in Lisbon, Portugal! For a copy of the Program Agenda, Registration and Volunteer opportunities, please CLICK HERE! May 16th – World Congenital Disorders of Glycosylation (CDG) Awareness Day! May 16, 2016 was the first recognized Congenital Disorders of Glycosylation (CDG) Awareness Day throughout the United States! What will you be doing on May 16th? Supporting global efforts to make this 4th Annual Campaign to Support World Congenital Disorders of Glycosylation (CDG) Awareness Day the biggest success to date! Join our efforts to raise $75,000 to advance CDG awareness, education, research, and resources for families that will help to improves the lives of children and young adults diagnosed with CDG! This year’s Campaign will run February 28th through May 16th. If you are organizing or running in a 5K run/walk, asking families to donate to your favorite cause for your birthday, or doing a tribute in honor of a loved one… we have got you covered! Crowdrise is an easy use charity platform. Just visit our Donations Page, create your Fundraiser or Event, and join our efforts to raise CDG Awareness in your Community and Nationwide! We are again offering CDG Awareness Day wristbands and magnets while supplies last! These items are perfect to give to friends, share with schools, distribute amongst your community and show your support for CDG Awareness Day! We are also actively looking for volunteers! If you are interested in volunteering to serve as a CDG CARE State Advocate Representative, please send us an email at proclamation@cdgcare.com. We are in need of one Volunteer from each of the 50 States, so help us Paint the US GREEN and email us TODAY! To access and download the complete toolkit containing social media materials, event maps, handprints, educational and press kit resources, please visit World CDG Awareness Day Campaign! The 3rd World Conference on CDG for families and professionals: United shaping the future for CDG, was held the 15th and 16th of July, 2017 in Leuven, Belgium. For additional information, please visit apcdg.com. CDG CARE is proud to partner with the Invitae Patient Insights Network (PIN) and Cerecor to offer the first international CDG Patient Registry – CDG Connect! CDG Connect will serve as the centralized global network for CDG patients, researchers and drug developers to amplify the voice of CDG patients and optimize the search for better treatments. CLICK HERE to enroll in CDG Connect TODAY! Share your experiences, access data and insights and advance research for CDG. Your participation may help us discover findings to improve patient lives. Together, we can build the CDG Connect Community! We are excited to announce that through continued funding and donor support, we are launching a new 2019 Family Education and Medical Travel Grant Program! To learn more about the financial support that will soon be available to CDG families, CLICK HERE to visit our Resources Page! CDG Patient Advocacy groups and professionals are united to combat major challenges faced by CDG patients and family members. This video shows us that together we can make a positive difference in patients’ lives. This video was funded by the Crowdfunding Project “One CD=One Live CDG”, done in 2014 by families, friends and professionals. DONATE NOW – With your gift, we can further our mission to promote CDG awareness, provide education and support to families affected by CDG, and advocate for scientific research to advance the diagnosis and treatment of CDG. 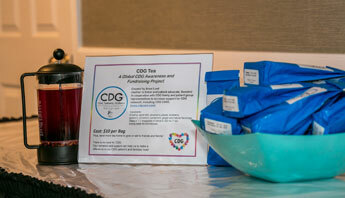 USA CDG Tea Launch – This highly anticipated Swedish tea is a special blend created by CDG parent, Anna Lund, and developed to promote global CDG awareness and research. CDG CARE is honored to supply the delicious loose leaf tea to those interested for purchase within the USA. Please send order inquiries to christa.doot@gmail.com.